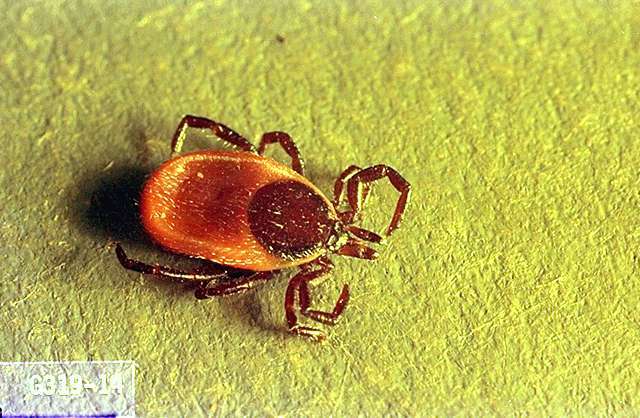 Includes Ixodes spp. and Dermacentor spp. abamectin ear tag (Tri-Zap)-One tag to each ear of all animals when ticks appear. Remove tags at end of season or before slaughter. diazinon/chlorpyrifos ear tag (Warrior)-One tag to each ear of all animals older than 3 months when pests appear. Remove tags at end of fly season or before slaughter. essential plant oils (Essentria IC3) at 30 to 90 ml (1 to 3 oz) per gal mineral oil. Spray directly on animal in amounts to cover. permethrin/piperonyl butoxide pour-on (Ultra Boss) at 3 ml per 100 lb body weight. Maximum of 30 ml (1 fl oz) per animal. Treat once every 2 weeks as needed. permethrin spray (GardStar 40% EC) at 30 to 118 ml (1 to 4 fl oz) per 25 gal water (0.013 to 0.05% ai). 1-2 quarts coarse spray over body of animal, thoroughly wet. zeta-cypermethrin/piperonyl butoxide dust (PYthon) at 2 oz per animal. Apply in dust bag, shaker, dusting glove, or mechanical duster. Repeat as needed but not more often than once every 3 days.